A local contractor closes a valve on his tanker truck after watering down the dirt roads to keep the dust down at the Range Resources hydraulic fracturing operation in Claysville, Pa.
Theres plenty of money to make in the natural gas drilling industry. 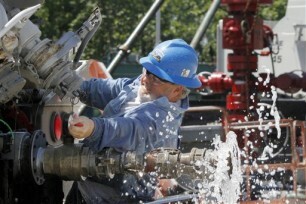 And it goes beyond the actual process of hydraulic fracturing. According to The Houston Chronicle, water cleanup is being a lucrative task as companies are needed to clean up the water coming out of the wells when hydraulic fracturing is performed. Mounting concerns about the high water demands of fracturing in arid regions and the risks of earthquakes tied to underground injection wells used to dispose of wastewater from the work are driving energy producers to reuse more of the fluids. This has prompted a scramble among recycling companies to gain a foothold in the new market. They’re pushing various technologies for removing contaminants from water before it is pumped into the ground at wells and clean it up after the jobs are done. About a third of the water used in fracturing emerges as flowback before a well starts producing, and more comes later from the formation itself as what the industry calls “produced water.” Although smaller in quantity, it tends to be dirtier than flowback.